Smart. Responsible. That's 17-year-old Breanna's role in her large family, and heaven forbid she put a toe out of line. Until one night of shockingly un-Breanna-like behavior puts her into a vicious cyberbully's line of fire - and brings fellow senior Thomas "Razor" Turner into her life. Razor lives for the Reign of Terror motorcycle club, and good girls like Breanna just don't belong. But when he learns she's being blackmailed over a compromising picture of the two of them - a picture that turns one unexpected and beautiful moment into ugliness - he knows it's time to step outside the rules. And so they make a pact: He'll help her track down her blackmailer, and in return she'll help him seek answers to the mystery that's haunted him - one that not even his club brothers have been willing to discuss. But the more time they spend together, the more their feelings grow. And suddenly they're both walking the edge of discovering who they really are, what they want, and where they're going from here. ©2016 Katie McGarry (P)2016 Harlequin Enterprises, Limited. I loved this book. There were surprises that I wasn't expecting but loved. I feel like pretty much everything author carries things out too long and it drives me crazy. That didn't happen at all in this book. One of my favorite books ever. Great story and message. I thought the Narrator Andrew Eiden was fantastic. His voice reminded me of Christian Slater. What made the experience of listening to Walk the Edge the most enjoyable? I'm enjoying this book series and they're fun and light, while still attention-grabbing. The only thing I had a rough time with here was Callie Dalton's narration of the main character, Briana. Dalton has both a nasally voice and a lisp, and both flaws are maddeningly distracting from the story. They took me right out of it, which is too bad, since the male narration by Andrew Eiden is outstanding. Razor - layered, complex, and interesting. No more Callie Dalton narrations, please! Her lisp and her nasally voice are very distracting, plus she occasionally morphed in and out of a southern accent. Her performance itself is fine but her other issues left me very distracted throughout her narrations and took me out of the story.. Andrew Eiden - voicing the character of Razor - on the other hand, is outstanding. He's the reason I stuck with listening through the whole book. Loved his performance. Nope - no extreme reaction. 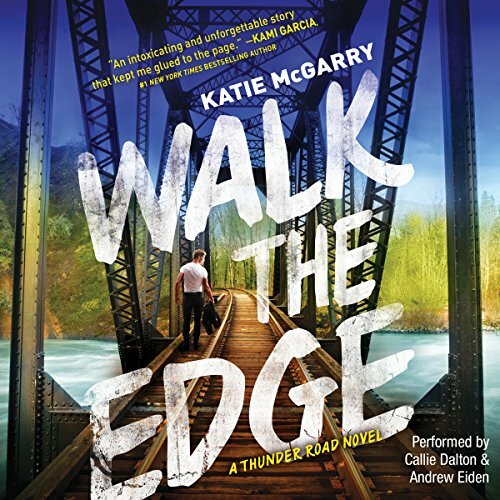 Where does Walk the Edge rank among all the audiobooks you’ve listened to so far? Walk the Edge is by far one of the best audiobooks I have listened to. Not only is the story captivating, realistic and certainly edgy, the performance was superb. High school angst usually isn't my style of entertainment, but this story goes beyond teenage drama. The feelings, interactions and issues are timely, poignant, and portrayed in such a way that any age will enjoy the read and - dare I say - come away with something valuable. What was one of the most memorable moments of Walk the Edge? What does Callie Dalton and Andrew Eiden bring to the story that you wouldn’t experience if you just read the book? Callie and Andrew were both able to perform the essence of this book without overwhelming the story with their own spin. It's a very fine line to walk and the accomplished it superbly. Innocence...experience, trust...treachery. Worlds apart...yet on the same edge between them. When you Walk the Edge, what do you trust? No time for additional comments...gotta go find Katie McGarry's fan page! So Much More Than An MC Romance! Book two was just as good as book one in the series. I was hooked... a young adult MC romance... I couldn't resist after seeing the genre and reading the blurb. And I wasn't disappointed. This angst-filled, realistic tale of young love and the coming of age within circumstances beyond your control was narrated perfectly. I can't say enough positive about this book... and this series. Not as good as the first but still deserves 5 stars. I can't wait for the next one in the series to release. kind of slow starting and lots of frustration on the way to a exciting ending.